The small village of Arnol lies on the coastal side of the main A858 as it makes its way down the north west side of Lewis. At the far end of the village is the Blackhouse Museum, an unmissable visit for anyone wanting to understand a way of life once widespread in Lewis. 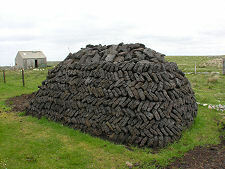 A blackhouse usually comprised a long narrow building, often with one or more additional buildings laid parallel to it and sharing a common wall. 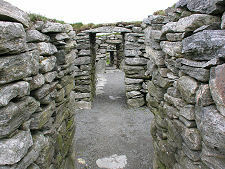 The walls were made from an inner and outer layer of unmortared stones, the gap between them filled with peat and earth. The roof would be based on a wooden frame, resting on the inner stone walls, giving the very characteristic wall-ledge. Over the frame would be laid an overlapping layer of heathery turves, and over this would be laid a layer of thatch. The thatch would be secured by an old fishing net or by twine, attached to large rocks whose weight held everything down. More rocks would be laid around the bottom of the roof, where it met the inner wall. The roof traditionally had no chimney, the smoke from the peat fire in the central hearth simply finding its own way out as it could. The smoked thatch was considered an excellent fertiliser and it was normal to strip it off for this purpose and rethatch the roof each year. 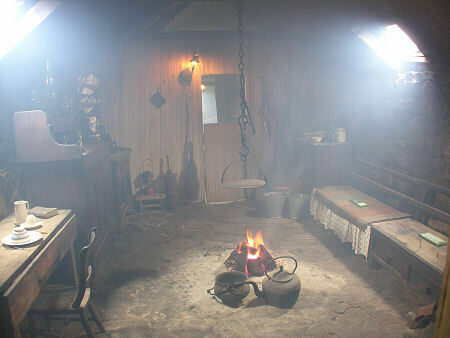 The floor of the living area of the blackhouse would usually be flagged. The animals would be at one end of the house, and in the byre area there would be earth flooring, usually with a drain for some of the animal waste. 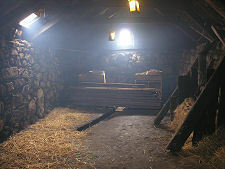 Part of the blackhouse would also be used as a barn for storage and processing of grain and other products. It is tempting to think that the name "blackhouse" had something to do with the largely windowless darkness in which people would have lived, or the peat smoke. In fact it stems from the introduction of more modern housing from the end of the 1800s in response to legal and other pressures, especially to separate housing for people from housing for animals. 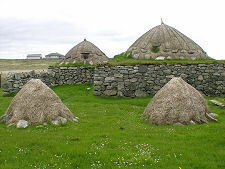 These new cottages became known as "white houses", and the more traditional dwellings they started to replace became know as blackhouses simply to distinguish the two styles. 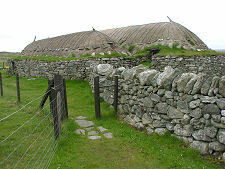 While the underlying design of the blackhouses may seem to have a direct lineage dating back to Orkney's Skara Brae, 5,000 years ago, most were not as old as you might think. The blackhouse used as the museum was built as recently as 1875. And in 1960 there were still nine blackhouses in use in Arnol: while the group now restored as the blackhouse village at Gearrannan, further along the coast, was only abandoned in 1974. The building housing the museum, No. 42 Arnol, is generally authentic, though now roofed to a much higher standard, especially at the byre end, than would have been typical at the time. 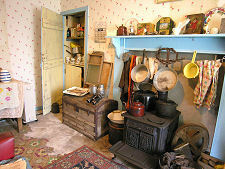 It also spares visitors the experience of sharing a roof with the animals, and some of the 1900s additions like lino floors and roughly hung wallpaper extending into the roof have also been removed. But even if what you see today is a slightly sanitised version of life in a blackhouse, the atmosphere is still remarkable: literally. 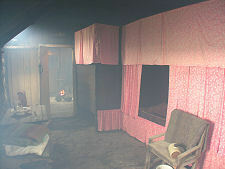 With a peat fire smouldering away in the central hearth, you might emerge free of the smell of animals, but you will certainly emerge wondering how the residents survived the all pervasive peat smoke. 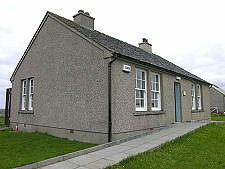 The Blackhouse Museum is run by Historic Environment Scotland. It is part of a fascinating complex that comprises the blackhouse itself and an equally interesting "white house", the cottage opposite, furnished as it was in the 1950s and representing the world into which blackhouse residents moved. Next to the white house are the walls of another series of blackhouses, showing an alternative layout to the restored Number 42. 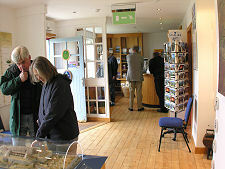 Completing the complex is an excellent visitor centre in another nearby converted cottage. 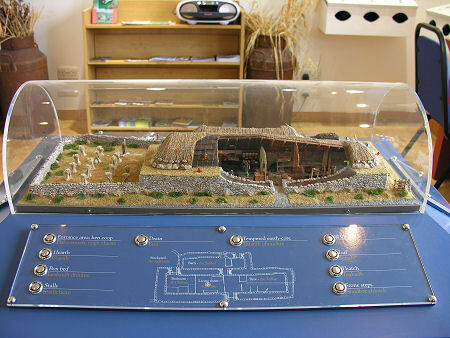 This provides background information and has a very helpful cutaway model of the blackhouse. 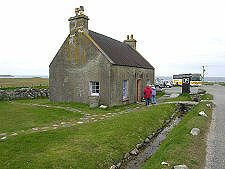 The Blackhouse Museum is open all year round: but is closed on Sundays. STB 5 Star Historic House.